The majority of hotels are losing out on a lot of business for one very simple reason: their hotel website is poorly designed. It isn’t optimised. It isn’t converting interested travellers into confirmed guests. From small bed and breakfasts to swanky boutique chains, few seem to have really mastered the art of the hotel website—which is a shame, since it’s the most important part of their direct conversion funnel. There are some hotels, however, that have found the secret to designing beautiful hotel websites that drive direct bookings. So that you can improve the look and function of your own website, we’ll share with you the five fundamental elements of web design and the real-life hotel websites that have nailed them, inspiring travellers to book instead of bounce. Get noticed with large, high-quality images that take the viewer’s breath away. Of all the hotel websites on this list, Cap Rocat has perhaps the most stunning digital curb appeal. As soon as you land on the hotel’s homepage, you’re pulled in further by the grand, high-quality carousel of hotel images showcasing the impressive entrance and luxurious amenities. 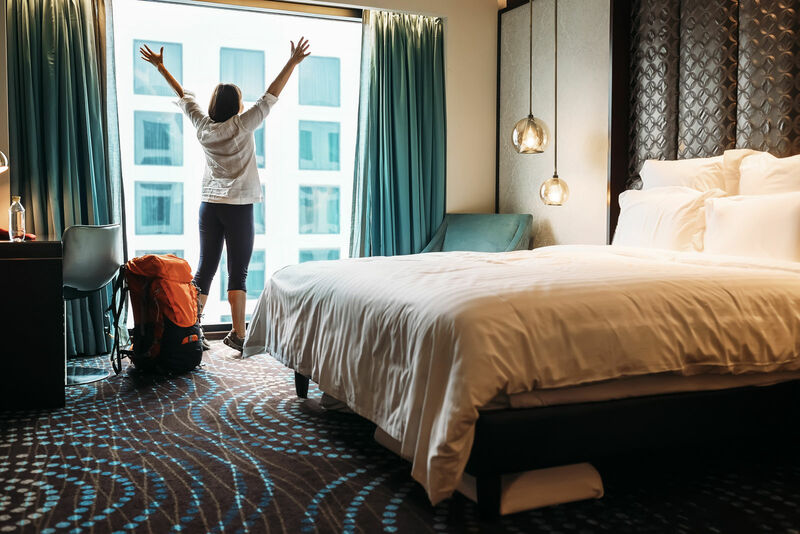 And although this hotel is especially photogenic, high-quality images are something that you can achieve affordably regardless of your hotel style. Use images wisely to encourage viewers to stay on your website. Only show off your best shots and make sure they are optimally sized for your page so that you can convert more travellers into guests. Consider adding a direct booking promotion right on the homepage. The Palladio website combines digital curb appeal with a smart direct booking bid that gets right to the point: book on the official website. This direct booking promotion is smart, visually attractive, and intuitive. It’s enhanced by the alluring hotel imagery and the clean and organised structure of the homepage. Relevant menu options (book now, rooms, amenities, images, location, etc.) are visible from the homepage. No scrolling or clicking required. The messaging of the direct booking promotion itself is minimal and compelling. Each element—images, messaging, and layout—supports the others, and viewers are enticed by the benefits of booking directly as a result. Most websites will enable you to activate templates with these features. Try them out to support your bid for direct bookings; but don’t be salesy. Instead, show travellers what’s in it for them. Utilise captivating descriptions to appeal to travellers’ emotions. Langham has a way with words and it’s drumming up business. Instead of stating the obvious, they go with text that is emotive and benefit driven for the potential guest. This approach to hotel web design helps travellers picture themselves in that specific hotel. It encourages them to click through, explore, and book rather than bounce. Although the text should stand out against beautiful hotel images, it should not distract from them. For Langham, the words seem to jump off the page and into the traveller’s imagination. Do the same for your hotel website. Add a few colourful lines in a modern, easy-to-read font that doesn’t compete with other visual elements. Reassess your web design layout and aim for simple sophistication. 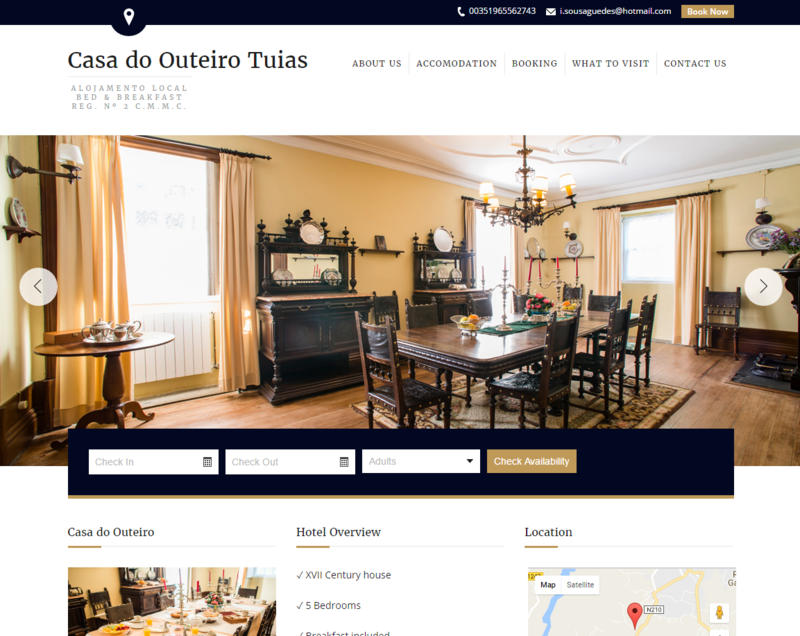 Casa do Outeiro Tuias is affordable luxury defined. The independently run five-room bed and breakfast prides itself on its simple sophistication. They provide a stellar guest experience and let the stunning Baroque design speak for itself. Their web design shares a similar structure. The homepage only contains what potential guests want to see. The aesthetic is clean and refined. Text is minimal and to the point, and the carousel of hotel images is fetching and well-timed. In just a few seconds, travellers know why they want to book and how to do it. Showcase your rooms with a dedicated section for each type. Many hotels fail to give each and every room the attention it deserves on their website. This is a big mistake. Each room is unique, and travellers want to browse all options to make an informed decision; travellers who know EXACTLY what they can expect feel more confident about booking. It really is that straightforward. Hotel West End understands this more than most hotels. Instead of a general photo gallery that shows everything from the doorknob to the hallways, they’ve used wide-angle shots of each room type. They then paired these images with the size and price of the rooms pictured. This intuitive web design layout shows travellers the most sought-after details clearly and in one place. Noticed a trend among these beautiful hotel websites? Each of the above hotel websites shares a very similar set of web design elements. They focus on large, high-quality images, a benefit-driven booking promotion, captivating descriptions, a simple layout, and a dedicated section for each room. By doing the same, you’ll reduce your bounce rate and start to drive bookings through your own beautiful direct booking channel.